^ Mary Cherif; Nathalie Leroy; Anna Banchieri; Armando Da Silva. "The Meditation Room in the UN Headquarters". UN.org. Retrieved 10 September 2013. ^ Borger, Julian (17 August 2011). "Dag Hammarskjöld: evidence suggests UN chief's plane was shot down". The Guardian. Retrieved 2 August 2014. ^ Borger, Julian (4 April 2014). "Dag Hammarskjöld's plane may have been shot down, ambassador warned". The Guardian. Retrieved 2 August 2014. ^ Bjorkdahl, Goran (17 August 2011). 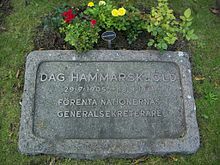 "Dag Hammarskjöld: I have no doubt Dag Hammarskjold's plane was brought down". The Guardian. Retrieved 2 August 2014. ^ Mary Cherif; Nathalie Leroy; Anna Banchieri; Armando Da Silva. 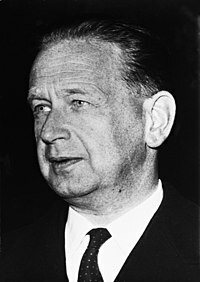 "Dag Hammarskjöld: The Un Years". UN.org. Retrieved 19 September 2011. ^ Alec Russell (13 May 2011). "The road to redemption". The Financial Times. Retrieved 14 May 2011. ^ "Neighborhood News". New York magazine. 14 March 2011. ^ "Colgate University : P-CON Fellowships and Awards". Colgate.edu. Retrieved 19 September 2011. ^ Mary Cherif; Nathalie Leroy; Anna Banchieri; Armando Da Silva. "Selection of stamps commemorating the life of Dag Hammarskjöld". UN.org. Retrieved 10 September 2013. ^ "Sveriges Riksbank/Riksbanken – Sweden's new banknotes and coins". Riksbank.com. Archived from the original on 27 September 2011. Retrieved 19 September 2011. ^ "Sweden's New Bank Notes". unknown. Retrieved 8 January 2015.